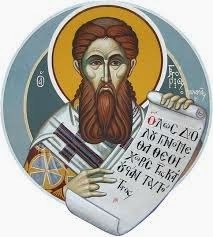 The theological arguments by Saint Gregory Palamas against Barlaam appear strongly in his work "Triads for the Defense of Those Who Practice Sacred Hesychasm". In the first Triad he answered the arguments of Barlaam based on the questions posed to him by a certain monk, but when he acquired the texts of Barlaam, which had been carefully concealed, then he specifically replied to these in his second Triad. And when Barlaam read the writings of Saint Gregory Palamas and accused him in his reply titled "Against Messalians", then Saint Gregory Palamas replied with his third Triad, and in this way he completely overturned the views of Barlaam, which, if they prevailed today we would be Uniates in theory and practice. This is how the work "Triads for the Defense of Those Who Practice Sacred Hesychasm" came to be. Yet, despite the vigorous reply of Saint Gregory Palamas to the views of Barlaam, still there exist Orthodox theologians, who in their own "theological system", knowingly or unknowingly, have accepted the views of Barlaam, or at least they use his methodology. To see what Barlaam professed, we will present his thought as we encounter it in the second and third Triads of Saint Gregory Palamas. First, he refers to knowledge and excludes human wisdom against that of divine wisdom. The work of Barlaam on this subject must have had the title "On Ideas" or "On Knowledge" or "On the Creation of Wisdom". The views of Barlaam on this issue seem to have been the following: he gives priority to "outer wisdom" or philosophy, which even monks should seek, because only through human wisdom can we achieve dispassion, to approach perfection and sanctification. This is because he considers Greek education to be a gift from God similar to the revelation given to the Prophets and Apostles. Also, the "logoi of beings" can be found in the divine and initial and creative Mind and images of these ideas have been placed in the soul of man, which we must come to know in order to get rid of ignorance with divisive, syllogistic and analytical methods, and in this way we will become in the likeness of God and will live after death. One sees in these views the ancient Platonic tradition, classical metaphysics and scholastic theology, according to which logic and its syllogisms has a priority in arriving at the knowledge of God and the communion of man with God is through archetypal beings. Second, the views of Barlaam refer to the way of prayer and its relation to the mind and body. This work of Barlaam must have had the title "On Prayer" or "On Human Perfection" or "On Prayer and Human Perfection". According to his views, the mind of man in prayer must distance itself from the body and not be enclosed within it. It therefore invalidates the teachings of the Apostles and Fathers on the coming of the Grace of God to the body through the nous. With these views he clearly ignores noetic prayer, there is no distinction between nous and reason, and the philosophical way of salvation dominates, namely knowledge of archetypal beings through philosophy and dialectical reflection. Moreover, he does not only question the hesychast tradition, as it was experienced by the monks of Mount Athos, but rejects it as allegedly something that is completely foreign to the Christian teaching. Here we clearly see the impact of classical metaphysics on Barlaam. Third, the views of Barlaam refer to the Light of God and what the nature of the divine Light is that appeared on Mount Tabor. The work of Barlaam on this particular issue must have been titled "On the Light". In this work he argues that any illumination that is perceived with the senses is a delusion or symbolic. Within this perspective he included all the revelations of God to the Prophets, to the Taboric Light at the Transfiguration of Christ, and the coming of the Holy Spirit on Pentecost. Conversely, he considered only human knowledge to be above the sense of illumination, which is why human knowledge acquired by some with reason he considered to be better than the light and the end of all theoria. Here he clearly prefers philosophy, reflection, metaphysics and logical analysis against the experience of divine vision and the method leading to this, namely hesychasm. As it appears, Barlaam considered the experience of the uncreated Light that takes place in the transfigured senses to be a delusion, while putting weight on philosophy, by which he came to know God through his reasoning process, since reason is the most noble element of human existence. These three views of Barlaam are presented entirely in the second Triad, in which Saint Gregory Palamas was able to reference the very texts of Barlaam, which of course are condemned by the Athonite Saint with powerful arguments taken from Holy Scripture, the Patristic tradition and the contemporary experience of the hesychasts, and obviously his own as well. From the above it seems clear that Barlaam exaggerated outer wisdom, namely the philosophy of the philosophers, at the expense of the revelatory experiences of the Prophets, Apostles and Fathers, criticizing noetic prayer as a delusion, because he supported himself on syllogistic and stochastic analysis and denied the participation of the body in theosis. He also over-analyzed or misinterpreted the vision of uncreated Light to be dangerous, because according to him perfection does not come with the purification of the heart, the illumination of the nous and theosis, but through reasoning knowledge, the knowledge of archetypal beings, scholastic analogies and metaphysics. Thus he bypasses all the revelatory experiences of the Prophets, Apostles and Saints and he underestimates the method leading to the vision of God, which is sacred hesychasm. Therefore, he exaggerates "reasonable worship" and sets it against noetic worship. Important also is the way Barlaam and those like-minded with him operated, as it appears in the third question given by the anonymous monk to Saint Gregory Palamas. As he says, Barlaam and those who support his views are unlearned in patristic writings, they have not had a personal experience of God, they are distinguished by their arrogance and they use the mind of the flesh, which is reason, and they openly slander the Fathers. If someone opposes their words, they attribute this to their empathy which shows their delusion. Indeed, Barlaamists attack those who do not agree with them in many ways, mimicking the "twisting and cunning of the serpent", using twisty plots and reasons, and each time they explain their opinions with contradictions. Because they have no certainty of the truth, this is why they are hostile, and when they are rebuked by their conscience they attempt to hide, like Adam did after the fall, below the assortments, conundrums and dubiousness of reason towards various meanings. These are what Barlaam maintained in relation to the hesychast tradition and the God-seeing experience of the Prophets, Apostles and Fathers. These views can be characterized as Barlaamism. The way Barlaam and those like-minded with him operated, as analyzed above, can also be characterized as Barlaamism.